Thread: North Koreas Meth problem..
Theres an interview I cant embed at this link.. The 25-year-old North Korean man knew there would be no turning back once he escaped from North Korea across to the Chinese side of the frozen Tumen River. It was February 2009 and he knew he’d need to be swift to avoid detection by the armed North Korean and Chinese border guards. He says only one thing could give him that clarity—the narcotic crystal meth, or methamphetamine. Before his defection to South Korea, he says he used the drug, known as “bingdu” or “ice” in the North, off and on for about three years. He says it was easy to score, dealers worked the streets of his hometown of Hamhung, South Hamgyung Province. 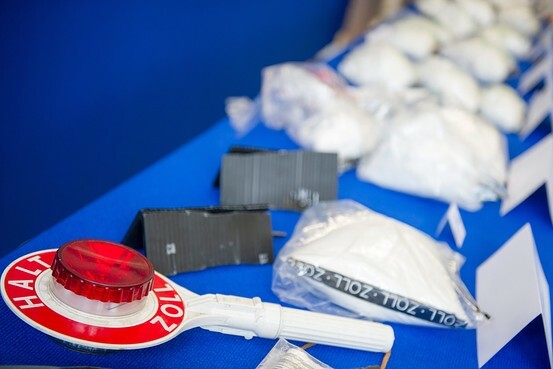 A customs signaling disc lies on a table next to 20 kg of the illegal drug crystal meth in Munich, Germany. The man and his friends would get high together before dinner and the buzz kept them awake all night. “Doing ice was a social thing; it was a lot of fun,” he said. Throughout the 1990s and into the next decade, opium was the narcotic of choice for both the cash-strapped Kim Jong Il regime and the populace. But by the mid 2000s, the poppy fields began to disappear and meth became pervasive. As with most details regarding the North, Pyongyang offers no official statistics on the prevalence of illegal drug consumption. The study is the first to attempt to put a number on how widespread the use of crystal meth has become. 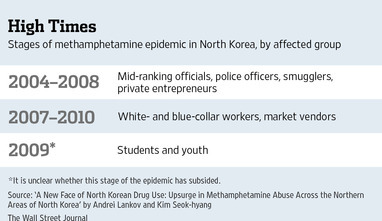 How North Koreans kick their meth habit is unclear. Prof. Kim, a former Unification Ministry official who now lectures at Ewha Womans University, says some of the refugees she interviewed for the study deny that ice is addictive at all. “They say you can stop it whenever you want. All you need to do is sleep all day long, for three or four days,” she says. Extreme fatigue, anxiety and depression are effects of methamphetamine withdrawal, say health advocates. And according to some North Korean defectors, addicts back home are using other drugs to help them get clean and cope with the symptoms of coming off ice. “People who are addicted to ice cannot sleep, so they buy sleeping pills off the black market as a counterbalance to the drug,” says Kim Young-il, who heads the Seoul-based refugee association PSCORE. Not all North Koreans are able to shake off their dependency on drugs even after making it to South Korea. In a paper entitled “Drug Misuse by North Korean Defectors,” psychiatrist Jeon Jin-young of the Ministry of Unification’s Hanawon resettlement facility writes that self-diagnosis, doctor shopping and abuse of prescription medication, including sleeping pills, is a growing trend within South Korea’s defector community, which numbers more than 25,000. The Ministry of Unification declined to respond to specific questions regarding drug use or provide a Hanawon doctor to be interviewed for this article. Prof. Kim says the South Korean government has tried to deal with the issue quietly. “They need to recognize openly how serious the drug issue is and try to find a solution in an open manner,” she said. As for the 25-year-old defector, he says he never felt addicted to ice and looks back fondly on his experiences getting high with his friends in the North. But like many other things he’s left behind, that aspect of his life stopped at the border. Makes sense. Cheap to make, and takes away the need for food! Tho they say that.. Every meth heads house I have ever been to has been a dump !! I remember once when we were kids, we did a bunch of acid and on the comedown felt grimy and dirty and you have that funny still tripping mood that everything looks messy and with a sheen of (fractal) dirt.. We were at my buddys parents house and started doing a simple tidy up, that turned into a clean, that turned into a full on scrub every bit of the house.. I remember realizing we had to stop when he was washing down the outside of the washing up liquid bottle !!! His parents came back to the spotless,, super clean house.. The things you do on drugs ! !